When investing in real estate, you will meet a lot of people who want to do business with you. Whether you are buying or selling, it can be difficult to know who to trust. Make sure to do your due-diligence. Make sure this person doesn’t have a history of bad deals or unsatisfied customers. It can be very beneficial to make strong contacts, creating a circle of people you can trust. Within this circle, you will want to include a CPA, a lawyer, an agent and an investment company such as USA Prime Properties. Buying from an investment company will allow you to easily get references and obtain the peace of mind needed when buying an investment property. Like you, we are after the best deals. 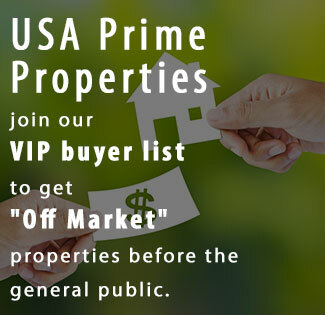 We only buy and sell the best off-market properties in USA. Once you have achieved success in real estate investment, one of the most enjoyable things you can do is to give back to other “green” investors who were once in your shoes. There is enough to go around for everyone and by sharing what you know, you help pass down the dream of wealth through real estate. At USA Prime Properties, we practice this ourselves. Like you, we are investors who buy and sell in the USA area. It is our goal to help other investors achieve the same levels of success we have. There are many benefits to real estate investment that can help you on your way to complete and total financial freedom. We would love to share with you what we have learned!